I should begin this blog by saying that I originally thought that a kanban was a just a new type of move used while dancing the Can-Can, but I already used that joke for the poka yoke blog. Instead, I’ll spare you and jump right into things! So, what is a kanban? A kanban is a quality improvement method that can help regulate the production flow in the value stream. I like to think of it as a “visual” signal that triggers replenishment or withdrawal in a pull system. In fact, I’ve found the kanban system helpful for organizing both my personal and work to-do lists. I use sticky notes to organize tasks into three columns—tasks that I know need to be done in the future (my backlog), tasks that I’m working on now, or "work in progress" (my WIP), and tasks that I’ve completed. An empty WIP column is a kanban trigger for me to reach for more sticky note tasks currently in my backlog and move them over to my WIP. Sound familiar? I also like to use this technique in my marriage when it comes to managing “honey-do” lists for my husband. Kanbans can be part of a successful just-in-time (JIT) Lean Six Sigma production schedule. Each process on a production line operating by JIT pulls just the number and type of pieces the process needs, at just the right time. 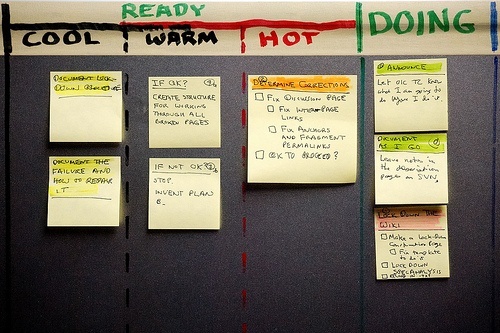 A kanban can be an actual card or electronic board that provides information answering questions such as when and how much, which are sent to authorize the make or move of a specific product when a container is empty. A kanban can also be a painted or taped line placed on the floor of the plant can limit inventory space by showing that it can only hold 20 pallets of a supply. This makes it easy for factory workers to keep an eye on the number of pallets that need to be added, or if there’s no space for an additional pallet to be brought to the factory floor. Even simpler kanbans include flags or alarms that are signaled when more parts are required. 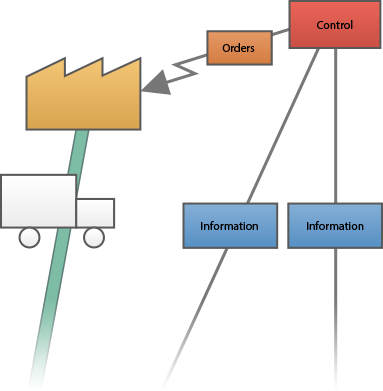 Kanbans can also be used as a signal for transferring products or alerting outside suppliers that more inventory is needed. Kanbans are best used by companies with a simple product and uncomplicated production schedule. They aren’t great for future planning; they don’t look ahead because they replace what is used. They’re best when accompanying a good material planning system that’s already in place. Kanbans are beneficial because they limit WIP and inventory build-up. A build-up of inventory can hide problems and defects and increase product lead times. Having a low inventory supply is valuable because less space is being taken up and handling damages can be lessened, which can save money. In Companion by Minitab, value stream maps can help you keep track of the total number of kanbans between an operation and its supplying operation, as well as the quantity requested and delivered as a lot by one kanban. You can try Companion free for 30 days. Have you implemented kanbans in your company’s process lines?